Wood-framed buildings are quite well understood by architects, carpenters, building code officials, and others, so why are there so many squeaky wood floors? The concepts of platform framing have remained the same for decades. Even though material choices have changed, the basic principles haven’t. Of course, dimensional framing lumber has gotten smaller in actual dimensions, floor spans have tended to increase, and the availability of high-quality wood has decreased, all of which could be contributing factors. In response, engineered wood products have filled the void by providing consistently strong, stiff materials in the form of trusses, laminated veneer lumber oriented strand board, plywood, I-joists, and other advanced products. Fasteners and adhesives have also gotten better with some notable engineering improvements. Could it be a labor problem? With labor shortages crunching time availability on jobs and a lack of experienced tradesmen in general, perhaps the floor framing system is being rushed and quality control is suffering. Perhaps it is a combination of all of these things in different degrees in different projects. Whatever the reason, squeaking wood floors are a problem for owners, occupants, contractors/builders, and architects because they scream an impression of poor quality and problems with the construction. Consideration of best construction practices and advanced material options from frame to finish can help designers specify solutions to help mitigate the potential for squeaks and related problems. Identify the durability and safety characteristics of high-performance wood-framed floor systems with superior strength and stiffness attributes. Investigate the multiple components of a wood-framed floor system, and the ways that they all contribute to improved performance and the elimination of movement and floor squeaks. Design and specify wood-framed floor systems that perform as intended, and reduce or eliminate squeaks that are harbingers of other issues. What causes a floor to squeak? Fundamentally, two pieces of material need to move or rub against each other, creating friction that emanates as sound. Those materials can be wood against wood, as in subfloor panels rubbing against floor joists, or wood against metal, as in fasteners or ductwork rubbing against floor trusses. It is this differential movement between different components or materials that commonly causes squeaks in wood-framed floor systems. More significantly, it reveals that something may not be performing as intended. Minimizing or eliminating this movement will minimize or eliminate the squeaks and perhaps the underlying problems. The biggest reason to design against floor squeaks is to help achieve long-term durability of the floor and help mitigate owner or occupant complaints or concerns with quality. Floor squeaks are often referenced as a common reason for callbacks.1,2 If the results aren’t satisfactory, owners can seek retribution and even litigation against contractors, architects, developers, and anyone else involved. Are those claims justified? Sometimes, yes. The squeaks can be a sign that the structure is deflecting more than it should. That might be a design error from undersized structural floor joists or trusses. Or it might also be because the subfloor wasn’t of adequate strength and stiffness or installed properly to be fully attached to the floor framing as required by the structural design. Or perhaps everything is fine with the design and installation but the materials were damaged and weakened from wet conditions during construction. All of these conditions are common in the framing of a structural wood floor, and if they aren’t addressed early, they can lead to longer-term and bigger problems, such as structural sagging, separation of components, or degradation of materials. Of course, there may be other signs of problems that are not readily visible in the structure but quite evident in the finish flooring. If the subfloor system is inadequate or compromised for any reason, then the finish flooring could be affected. This may be less noticeable where carpet is used, but it can be very noticeable if hardwood flooring, laminated or engineered wood flooring, or brittle finishes such as tile or stone are used. Movement in the subfloor usually telegraphs as movement in the finish flooring, and those products aren’t designed to endure that. Manufacturers of wood, tile, or stone floor products will usually indicate the conditions that are required for their flooring to be installed over and will not take any responsibility or honor a warranty if those conditions aren’t met. This just reinforces the point that is true in many parts of construction—there is no point in putting a high-quality, often costly finish material over an inadequate substrate. In the case of floors, a quality flooring material should be installed over a quality subfloor system. This is a very reasonable first step to help design quiet floors and protect against liability claims. A quality finished floor and living space requires that a quality subfloor system is constructed first to achieve structural integrity, avoid floor squeaks, and protect against costly problems. How do we overcome the challenges and achieve the needed quality of construction? We need to look at all of the components of a subfloor assembly and the interface with the finish flooring. Selecting products and systems that are reliable and carry quality assurance recognition is a good first step. In addition, understanding the installation of the materials and specifying an assembly that reduces risk of rework while helping applications move swiftly can all be a real asset during construction. In the following sections, we will look at each individual component of a floor assembly. Keep in mind though that any project needs to be designed holistically to minimize the opportunity for performance issues or installation problems. It would seem that of all the elements of a wood-framed floor system, the floor joists or trusses should be the most basic and easiest to address. After all, allowable spans for individual members have been standardized to the point that they can be looked up in printed tables in building codes or manufacturers’ literature. This is true whether it is for dimensional lumber identified by wood species (i.e., 2-by-8, 2-by-10, 2-by-12) used as floor joists, for open-web manufactured floor trusses, or for engineered I-joists of different sizes. Those tables even allow for different standard spacing of joists or trusses (i.e., 16, 19.2, 24 inches on center) and different live load levels (i.e., 30, 40, 50 psf). Having this range of choices is good and can allow for greater creativity and design freedom. However the designer’s role requires that, when selecting the appropriate size and type of floor framing member, he or she uses the correct criteria that matches the design conditions. It also requires that those criteria are clearly indicated on the construction documents so the correct framing members and spacing are constructed. It is reasonable to follow the basic selection process just described, but in the context of contemporary construction, it may also be prudent to acknowledge that some things are not perfect in wood floor framing. Dimensional lumber, for example, is not always in the ideal condition either when shipped or after installed, such that it may become warped, bowed, or cupped. From a structural load bearing perspective, it may still be fine, but from the perspective of eliminating floor squeaks, it may not be. If irregularities in the lumber cause gaps between floor joists and adjacent framing members, such as sole plates and beams, then there is the potential for movement between them. That movement and rubbing could not only cause squeaks, but it also add additional stresses to the framing, causing other issues over time. The choice of the type of framing member can also make a difference in the ability to overcome floor squeaks. For example, the subflooring needs to rest on top of the floor framing members not just in the middle of the subfloor panels but at the joints between the panels. The narrower the framing member, the less surface area for the joint connections to be made. That can be further compounded if a narrow joist is bowed or warped, such that the edges of two adjacent subfloor panels are not equally supported because the joist is not straight. 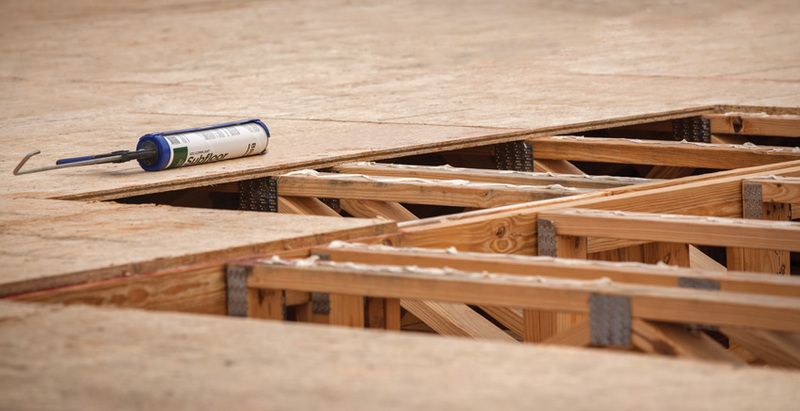 In any of these cases, a compromised joint or connection between subfloor panels because of the framing member can lead to an irregular condition that is prone to movement and squeaks afterward. Structural floor framing elements, whether joists or trusses, need to be selected to work successfully with subfloor structural panels. There can be other issues with floor framing members that need to be addressed, too. For example, it is common to use prefabricated, metal floor joist hangers to secure the ends of dimensional lumber or engineered joists to beams or other framing. These joist hangers have multiple holes for fasteners, and the intent is that they all actually receive fasteners—both into the joist and into the connecting member. The consequence of leaving any of those holes open (i.e., missing fasteners) is that the connection is not as strong as designed, which can lead to movement of the members. That movement can be a rotation of the joist or a movement of the hanger, either of which can cause a floor squeak and loosening of the hanger. One final item to consider is the presence of mechanical, electrical, and plumbing (M/E/P) lines that may be traversing through the floor framing. While nice, orderly penetrations can be designed and documented on drawings or neatly indicated on manufactured products, field conditions may not always be so perfect. Holes and openings cut in the wrong location or in too large a size can compromise the structural integrity of the framing member. That can create another source of movement in the member, which can then rub against those M/E/P lines and cause squeaks. If the building design calls for M/E/P lines to run through the floor framing, then they need to be addressed and designed properly. Open-web trusses are ideal if there are a lot of lines that can fit readily in the web openings. Solid web joists or dimensional lumber joists need to be inspected in the field to be sure that any drilled openings are structurally appropriate and don’t include contact with M/E/P lines. That means they need to be supported independently in a manner that will reduce or eliminate the potential for squeaks. Floor framing is only part of the floor assembly—the subfloor is also a part of the structural system. In fact, if you read the fine print in most of the framing member tables already discussed, you will discover that they rely on the presence of a structural panel on top of the framing members. That is because, when fully attached with glue and fasteners, the framing and subfloor act together as a continuous structural system. They become stronger together than they would be on their own (i.e., greater than the sum of their parts) based on “composite action.” In structural engineering terms, composite construction exists when two different materials are bound together so strongly that they act together as a single unit from a structural point of view. Historically, the traditional method of providing subflooring was to install solid boards at an angle to brace floor joists and receive the finish flooring. In the mid 1900s, that method was gradually replaced with engineered plywood that relied on alternating layers of thin layers of wood glued together. The grain direction in the layers alternated to maximize dimensional stability in the panel and to reduce movement between panels. Later, engineered oriented strand board (OSB) was developed as a cost-effective alternative that relied on using small strands of wood in resin instead of full layers. The alternating orientation of the strands achieved similar structural qualities when compared to plywood but also had some practical limitations. 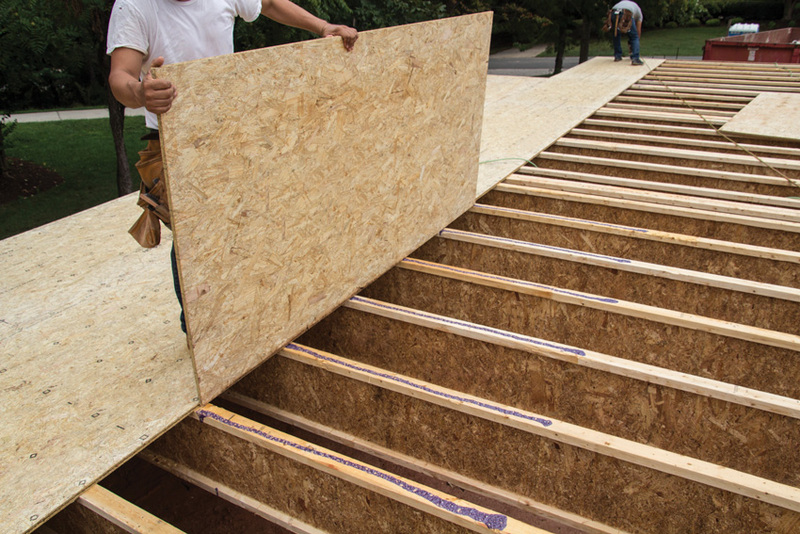 Common subfloor panels include plywood and OSB, which can warp, buckle, or expand when wet. Specifying high-performance engineered wood panels for subfloors can help protect against moisture damage during construction and help keep floors flat and stiff to prevent squeaks over time. 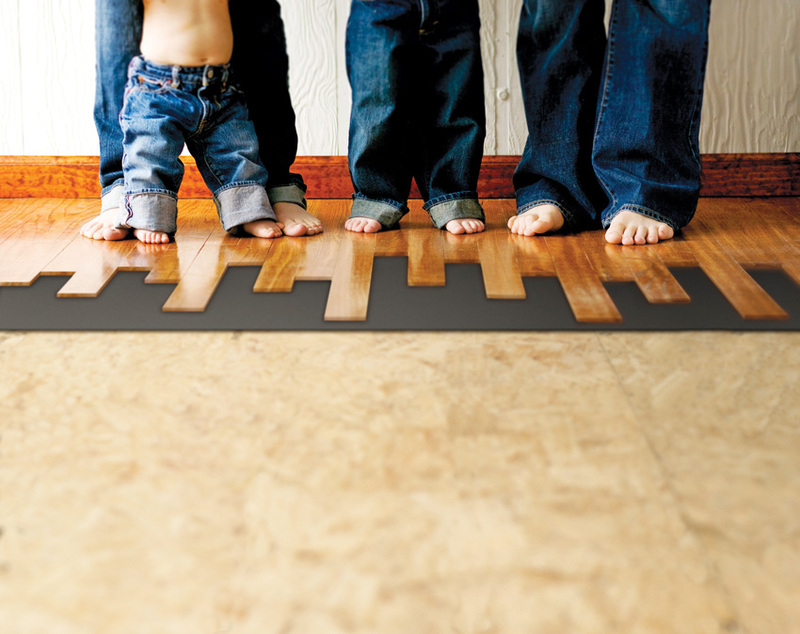 One of the latest advancements in subfloor materials are high-performance engineered wood panels. For example, one such product has obtained a third-party evaluation doumenting greater strength and stiffness compared to either plywood or OSB by virtue of their engineered design and makeup.3 That means they are less likely to bend, deflect, or warp when used and installed properly. The enhanced material composition of the high-performing engineered panel allows for precisely milled and extremely durable tongue-and-groove edge profiles that allow for easy installation. They also employ advanced moisture-resistant resins throughout the panels, which makes them less susceptible to moisture damage—a notable problem in plywood and OSB. They have even been tested to provide superb fastener-holding power to help keep floors flat and quiet. As an essential component at the core of a wood-framed floor system, let’s look at how these state-of-the-art subfloor panels can improve construction quality and help eliminate floor squeaks. 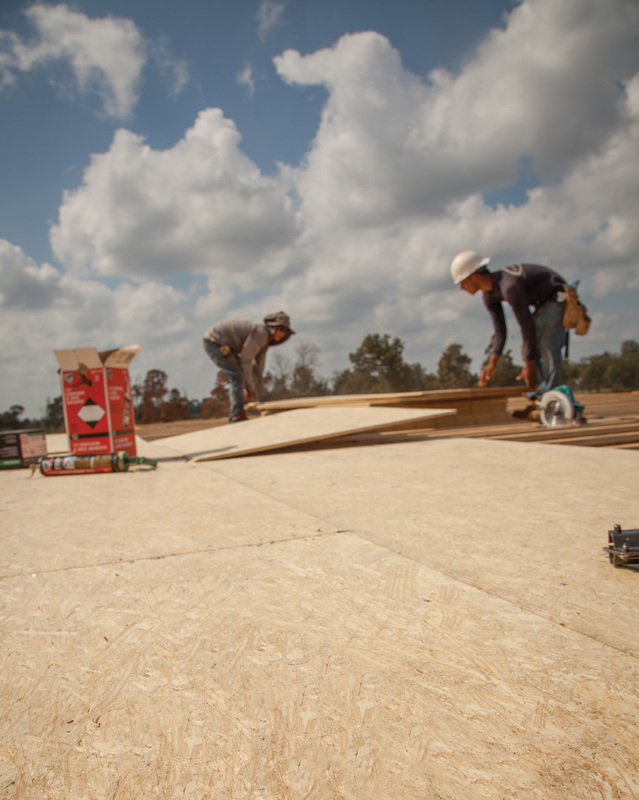 There are two ways that using stronger, moisture-resistant, high-performance engineered subfloor panels can make a notable difference in the quality of the finished project. The first is during construction. The tongue-and-groove profile design is different from plywood or OSB tongue-and-groove profiles, which can be more wedge-like, requiring the use of a sledge hammer to essentially friction fit the panels together. By contrast, high-performance panels fit together easily without requiring a sledge hammer since the profiles can be fabricated more precisely. This means that it is not a friction fit, and therefore the panel does not accumulate internal stresses that can lead to squeaks and pops. The other feature of high-performance panels is that the tongue-and-groove profile can be made with an integral gap spacer. The Engineered Wood Association (formerly the American Plywood Association, but still known as APA – The Engineered Wood Association) recommends that all engineered panels, including OSB, plywood, and high-performance panels, maintain approximately a 1/8-inch gap between panels to prevent buckling and accommodate any unwanted movement. The ability to achieve that gap with a sledge hammer on-site is inconsistent at best, while achieving it with an integral spacer makes it much more predictable and likely to be done properly. Common tongue-and-groove joints in plywood and OSB (left) are usually friction fit and require field determination of the proper gaps recommended by the APA – The Engineered Wood Association. 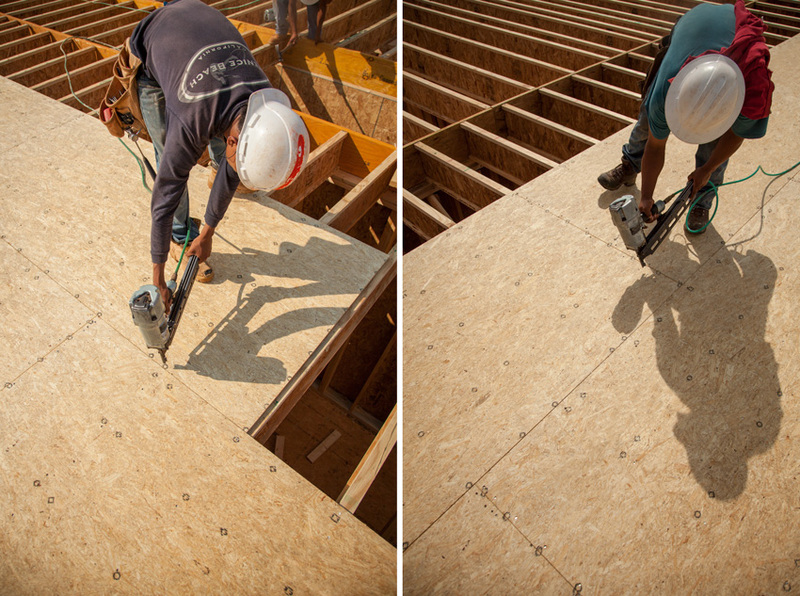 High-performance engineered subfloor panels have a more precise joint (right) that is not friction fit and can include an integral spacer as part of the profile. The other notable difference during construction when using high-performance panels is the ability to resist water damage. One of the key limitations of plywood and OSB is that moisture or rain exposure can create buckled or swollen seams since the panel edges are prone to absorb water and expand or delaminate. This can create an uneven subfloor that can lead to squeaks, finish floor issues, or other problems. The common field fix is to sand down the subfloor joints after the building is closed in and dry. That approach deals with the surface but not any internal damage to the subfloor or its ability to continue to perform as intended. The better solution is to specify from the beginning a subfloor that can withstand water from rainstorms, freezing/thawing, etc. High-performance engineered panels have been tested and shown to do that quite well, with up to a 500-day exposure warranty available. This means that the edges are much more likely to remain flat and smooth without inducing any stresses or irregularities to cause movement or squeaks. It also means that its strength and fastener holding power can be maintained through wet and dry construction cycles. Subflooring can get wet during construction and cause problems along the edge. In the comparison (bottom) of high-performance engineered panels on the right and plywood on the left, each board was soaked in one inch of water, colored with red food dye, for 3 hours. Results show progress through the 3-hour test. The second and most notable timeframe where high-performance engineered panels can make a difference is during the life of the building. Since they are rated for both strength and for stiffness, they are less likely to sag between framing members once they are fully loaded with people, furnishings, and equipment. It also means they are less likely to “bounce” when people walk across them. That can be important in many areas of construction but particularly around interior partitions. The up-and-down movement of a subfloor that lacks adequate stiffness can create some unwanted stresses where a partition is restricting that movement. Those stresses could get transferred not only to the partition but to the finish flooring around it, as well with unwanted consequences. The main distinction between different products and their engineered performance over time often comes down to the thickness of the material. Therefore, standards have been developed on how to classify and identify the acceptable thicknesses of engineered wood products of all types. Toward that end, a performance standard known as PS-2 has been developed. This standard, initiated by APA – The Engineered Wood Association, has been developed under the Procedures for the Development of Voluntary Product Standards for the U.S. Department of Commerce and published by the National Institute of Standards and Technology (NIST). The first edition of PS-2 was published in 1992, while the most current version is PS2-10, published in 2010. The goal of this standard is to establish structural criteria for assessing the acceptability of wood-based structural use panels for sheathing and single-floor applications. Specifically, it lists the minimum and maximum panel thickness tolerances for engineered panels. Those tolerances are within 1/32-inch (0.8 mm). Different manufacturers can rely on third-party testing to verify their actual product thickness and the consistency that they maintain to provide panels in any of the performance categories that they produce. The APA – The Engineered Wood Association has developed standards that determine minimum and maximum thickness tolerances for engineered wood panel products based on different performance class thicknesses. As noted already, a critical detail of structural flooring performance is the connection of the subfloor to the framing member. It is this connection that allows the whole system to act together with composite action and reduce unwanted movement within the system. It is also obviously important that the connection is complete and uniform so floor squeaks don’t emanate from the rubbing of the subfloor against the framing member. Toward these ends, there are two means for making the connection, both of which are recommended by the APA – The Engineered Wood Association to be used together, namely adhesives plus mechanical fasteners. The only way to assure that a continuous bond exists between the top of the framing member and the bottom of the subfloor panel is to provide a continuous application of glue or adhesive between them. Different types are available, including glues that are water based, solvent based, or polyurethane based. These are all commonly sold in caulk-style cartridges sized to fit into standard caulking guns. These mechanically squeezed cartridges are sometimes difficult to control, meaning that the amount of adhesive that actually comes out can be variable at best and quite messy at worst. Because of this, it is not uncommon to find that the amount of adhesive applied during subfloor installation is less than what is specified by the manufacturer for full adhesion. These squeeze-out adhesives are also temperature sensitive, especially in cold weather, meaning that their ability to fully adhere can be compromised if temperatures aren’t suitable. And just to make things a little more challenging, the tube packaging can be damaged if it gets wet, rendering it unusable and needing to be discarded. Perhaps because of these many difficulties, floor squeaks show up after the fact because the adhesive just isn’t doing what it was intended to do, thus weakening the ability of the floor system to remain rigid without movement. Now, with diligence and proper training, these challenges can be met, but it is tough to enforce and even tougher to inspect since it will be concealed when assembled. Fortunately, there is an alternative adhesive that is catching on in the form of polyurethane spray-foam adhesive that can help overcome many of the challenges of conventional adhesives. Polyurethane foam has been used in other building applications for air sealing and insulating due to its inherent properties that include adhesion and ease of use. When manufactured specifically as a polyurethane foam adhesive for subfloors, it is similarly fast and easy to install, typically with a more measured spray output than a caulking gun when a professional spray-foam gun applicator is used. Although one can costs more than a cartridge of glue, one subfloor manufacturer has introduced a polyurethane spray-foam adhesive that has an impressive coverage rate. In this case, one can of polyurethane foam adhesive is equal to about eight cartridges of mechanically squeezed adhesive when both are applied at manufacturer’s recommended rates.5 Perhaps more important in terms of working conditions, polyurethane spray-foam subfloor adhesive works well in wet and cold weather, and it will actually bond to wet and even frozen wood. All of these properties improve the likelihood that the proper amount of adhesive will be installed and that it will perform as intended regardless of most weather conditions. 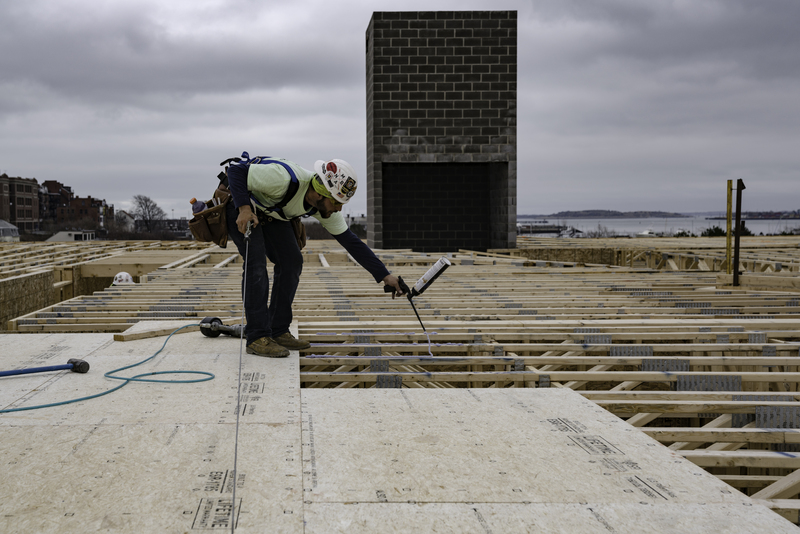 Spray-foam polyurethane subfloor adhesive provides an aggressive bond for the panel-to-joist connection that can be achieved even if applied in wet and cold conditions. The other half of the recommended connection of subfloor to framing is found in mechanical fasteners such as screws or nails. While the adhesive creates a continuous bond, it takes some time to cure and may not absorb all of the stresses imposed on the assembly. Therefore, mechanical fasteners are needed to assure both the immediate and long-term completeness of the bond for proper strength, stiffness, and squeak resistance. APA – The Engineered Wood Association also allows only mechanical fasteners but recommends both glued and screwed connections. The first question then becomes what type of fasteners to use. Screws have the greatest holding power and are preferred since they are most likely to pull the subfloor tight to the framing member. They are also not likely to work their way back out, as smooth shanked nails can be prone to do when wood dries or as the floor moves from normal use. Screws are also less likely to be impacted by wet conditions compared to dry conditions during construction. Nonetheless, not all contractors agree to use screws since nails are an acceptable engineered alternative. If nails are allowed, and the intent is to still assure long-term connection and elimination of squeaks, then deformed shank or screw shank nails should be used. Unlike smooth shanked nails, the deformed shank nails have irregular surfaces that provide as much friction as possible to resist pulling out or popping out. They may not have the holding strength of screws, but they can come close, and they will be superior to smooth shanked nails that have much less frictional resistance. Fastener spacing and location is the other critical item for connecting the subfloor to the framing member. Too few fasteners means that the bond will be weak and prone to movement and squeaks. Building codes specify minimum fastener type, size, and spacing for wood structural panels depending on whether they are being used on roof, walls, or subfloors. Minimum nailing requirements for subfloor panels are 8d nails spaced 6 inches along the edges and 12 inches at intermediate supports.6 Of course, how many of us have ever seen a carpenter in the field with a tape measure to assure that screws or nails were going in at that spacing? It is more productive and reliable if the subfloor panels actually come with preprinted fastener spacing marks on the panels. This not only helps assure proper spacing, it can help assure that the fasteners end up in the center of the framing member. Screws or deformed shank nails that miss the center of the framing below and stick out on the side are clearly less effective in terms of doing the job they were intended to do. These missed fasteners can also create their own rubbing against the adjacent wood and cause more unwanted floor squeaks. Mechanical fastening of subflooring using screws or deformed shank nails is facilitated by preprinted spacing marks on the subfloor panels. Of course, connections in other parts of the floor assembly are also important in the quest to eliminate floor squeaks. This includes fasteners for any incidental or auxiliary framing within the floor system and other wood-to-wood connections, such as blocking panels, squash blocks, multi-ply beams, and even bridging, if it is used. Similarly, the subfloor is the base for wall framing above it, and connections between partition walls, load bearing walls, and the floor system all need to be tight and secure to avoid differential movement between the floor and the wall framing. 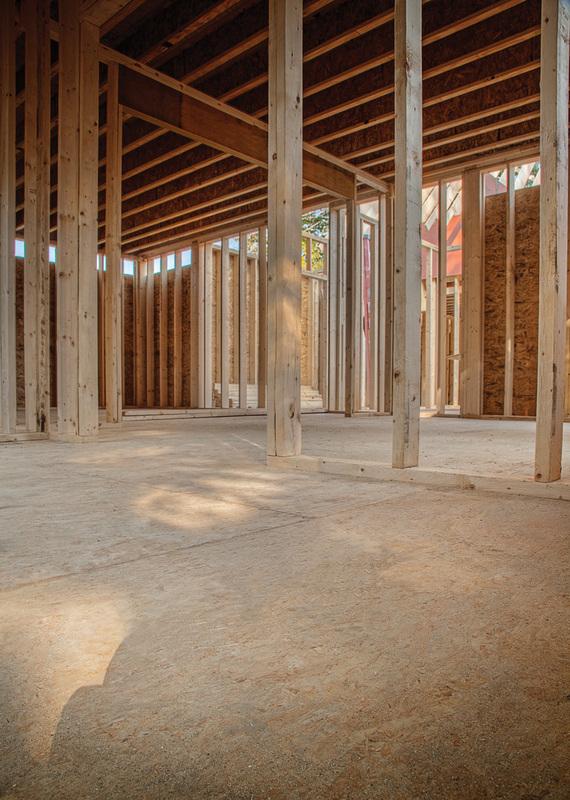 By now it should be abundantly clear that attention to the framing and subfloor construction details can make all the difference between quality construction and floors that are compromised and prone to squeaks and other defects. Only after these structural components are properly addressed does it then make sense to look at the finish flooring. As noted earlier, most of the issues that show up in the finish flooring after a building is occupied is usually the result of problems with the subfloor system. This can be true if the subfloor is uneven or unstable to begin with, and can also become true if the materials are damaged during construction or if the bond between the subfloor panels and the framing members isn’t complete. Hence, it is critical to address all of the issues we have talked about thus far before considering any expenditure on the finish flooring to be sure that the finish flooring can also be installed properly to mitigate risks of squeaks. Finished flooring in the form of carpeting, wood flooring, or tile can all be accommodated successfully and securely with high-performance subfloor panels. All of that said, there are some things to consider about the finish flooring itself to be sure that the project is completed properly and squeaks or other defects are avoided. The first is to be sure that the finish flooring and the subfloor system are designed and installed to work together. If they are nailed or secured together and one deflects or bends differently than the other, differential movement can occur between them as evidenced by telltale floor squeaks. In the case of wood flooring, that means proper nailing and proper installation following established guidelines and recommendations. For laminated or engineered wood products, the manufacturer’s recommendations and installation directions need to be adhered to. Most natural wood-plank flooring will have cleats or staples holding and securing the flooring to the subfloor. If the subfloor deflects too much or does not have the ability to hold on to the cleats or staples under foot traffic, then squeaks and pops can occur. In order to avoid this source of floor noise, it is important that the subfloor be both stiff and high in fastener holding power. For ceramic or porcelain tile flooring, underlayments can be adhered, fastened, or, in some cases, float on top of the subfloor. For the fastened systems, it is important for the subfloor be able to grab the fastener and not let go. However, no matter what underlayment is used, it is always important that the subfloor be stiff and not have excessive deflection. When a subfloor sags too much, cracks can occur. It is prudent to keep in mind the finish flooring when selecting subfloor panels since some are better suited to success than others for different flooring types. OSB is fine for carpets but can be prone to nail pops if a strong, high-performance engineered wood panel is not specified. Further, traditional OSB may not work as well for some hardwood flooring if it has become uneven from swelling during exposure during construction. 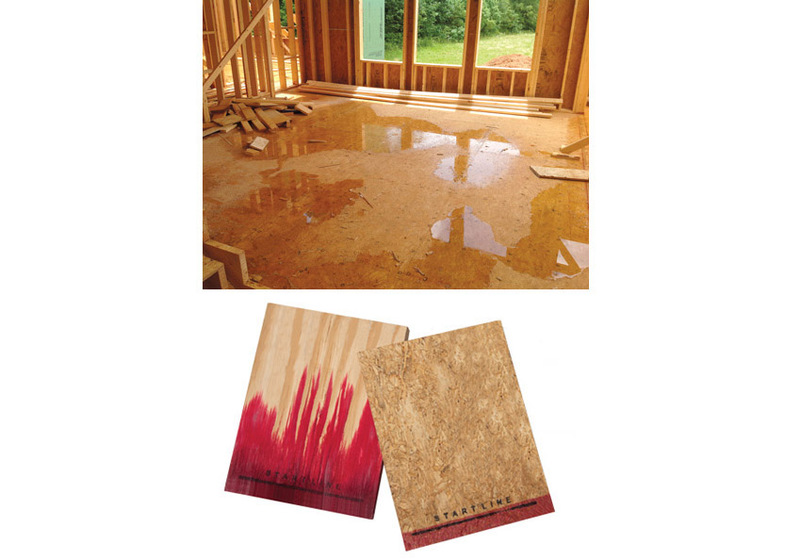 Plywood may provide adequate strength, but it still requires diligence to avoid problems with edges and seams if delamination occurs from moisture during construction. High-performance engineered wood panels have been used successfully on all finish flooring types, which is particularly useful if the final selections are uncertain or subject to change. Architects, builders, contractors, and remodelers who have experienced the pain of job delays, callbacks, or professional liability for squeaky subfloors can now work to avoid those problems. The combination of appropriately selected floor framing and high-performance engineered wood subfloor panels held together with deformed fasteners and polyurethane spray-foam subfloor adhesive can meet high-quality expectations for a solid, quiet flooring base. Further, the subfloor system can help reduce squeaks, bounce, or uneven finished flooring results by being designed with materials providing powerful moisture resistance, strength, and stiffness characteristics that help subfloor panels stay flat with no sanding required, even after exposure to harsh job-site conditions. In the end, the result is a quality project that will hold up over time and provide the intended satisfaction to the owners and users. Kevin Rogerson of Lindsey Construction Co. Inc. has been involved with building multifamily residential units in northwest Arkansas and seven surrounding states for more than two decades. When asked to name the number-one construction issue in building apartment homes, he doesn’t hesitate to answer. “Sound,” he says. “Think about how many people walk on flooring in multifamily units each day, then multiply that over the lifespan of a unit. Residents want quiet, stiff floors, and the construction materials we choose for our projects offer that assurance.” Floor squeaks are a definite problem to avoid in this case. Because of Lindsey Construction’s focus on building strong, resilient homes, the company uses high-performance wood engineered subflooring that performs differently from plywood and traditional OSB, for its construction projects. Rogerson, who helps oversee the construction of 1,500 to 1,800 multifamily units annually, says, “We’ve used the product for over 15 years and know firsthand it is designed to reduce the possibility of floor squeaks, which is critical in multifamily residential.” He also acknowledges that the high-performance engineered wood subfloor not only helps resist moisture during construction, but also during the life of their buildings in the event water seeps down below the finish floor for any reason. Brian Hall of Classica Homes in Charlotte, North Carolina, has been using high-performance engineered wood subfloor product ever since Classica Homes was started in 2010, and for an additional 10 years before that. Having a high-quality subfloor to install expensive hardwood floors over is critical, according to Hall. “If that part of the job isn’t done correctly, it doesn’t matter how you cover it up, you’re going to have problems,” he says. 1 Clark, Bob. “Top 10 Framing Errors and How to Avoid Them.” Professional Builder. 18 February 2012. Web. September 2016. http://www.probuilder.com/top-10-framing-errors-and-how-prevent-them. 2 Henkenius, Merle. “Fixing a Squeaky Floor.” This Old House. Web. September 2016. https://www.thisoldhouse.com/how-to/fixing-squeaky-floor. 3 See ESR-1785, an Evaluation Service Report by the International Code Council’s Evaluation Services, for the only structural panel with documented design values for strength, stiffness, and fastener holding power above code standards (PS-2). 4 When tested in accordance to ASTM D3498 standards, one spray-foam, gun-applied subfloor adhesive shows a bond that is two to five times stronger than the code minimum under various conditions. 5 Based on one spray-foam subfloor adhesive manufacturer’s testing: One can of the cited subfloor spray-foam subfloor adhesive yields approximately 400 linear feet of at a 1/2-inch diameter bead. When compared to a 28-ounce caulk cartridge of typical subfloor adhesive, applied at a 3/8-inch bead per the manufacturer’s instructions, the spray foam yields approximately eight times the coverage than that of the conventional adhesive. That means it would take eight cartridges of conventional adhesive to cover the same construction area as one container of this spray-foam adhesive. 6 See the International Residential Code (IRC), published by the International Code Council, Inc. (ICC).